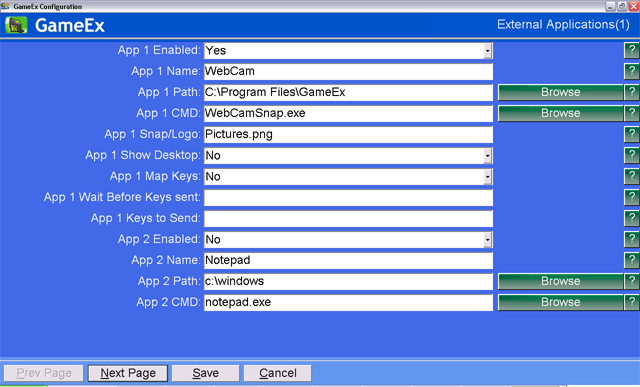 WebCamSnap - This program will allow you to take photo's and video's from your Webcam and view them in GameEx. Basically you add the files in the attached zip to your GameEx directory, then setup the program in GameEx config under External Applications. This program will display your webcam stream live in full screen. You press a key to take a photo or record a video. Make sure the PhotoDir and VideoDir settings are the same as your GameEx Pictures and Video directory. Now you can view your photos and video's in GameEx under Multimedia->Pictures/Videos. PlugInLCD - GameEx plugin that supports LEDWiz, PACDrive, BetaBrite, BPP-440, CrystalFontz, PJRC, ProLite hardware devices. It also supports Speech and Sample event driven effects. Rotate - Rotate the screen 90 or 270 degrees using hardware schematics (includes documents on how to create one) based on the game launched. Launch - This plugin allows you to launch apps before and after games in GameEx. It also allows you to launch games with extra variables from GameEx's standard launch method.